For more than 25 years, the National States Geographic Information Council (NSGIC) has boosted national geospatial policy and provided a forum for best practices exchange and collaboration. While NSGIC's core membership is made up of geographic information officers (GIOs) and state GIS coordinators, partners in federal, municipal and county government, academicians, representatives of other geospatial organizations and private industry experts are vital to NSGIC's mission of making critical connections. NSGIC members - and our partners - lead the way in the creation of intelligent maps and databases that equip public and private leaders to make more informed and timely decisions. The NSGIC Annual Conferences and Midyear Meetings draw key decision-makers from US states and territories, eliminating the need for cross-country travel to educate customers and prospects about your offerings. Having access to many state members in one location is not only efficient; it enables sponsors to gain critical insight into multiple government organizations, including how to navigate through state-specific procurement procedures. Networking with executives in the national geospatial community can translate into making the best connections to impact government policies, build partnerships and expand your business. View our 2019 sponsorship brochure HERE, detailing specific annual opportunities. New this year, we are offering 10 spots in an Emerging Partner Sponsorship program. 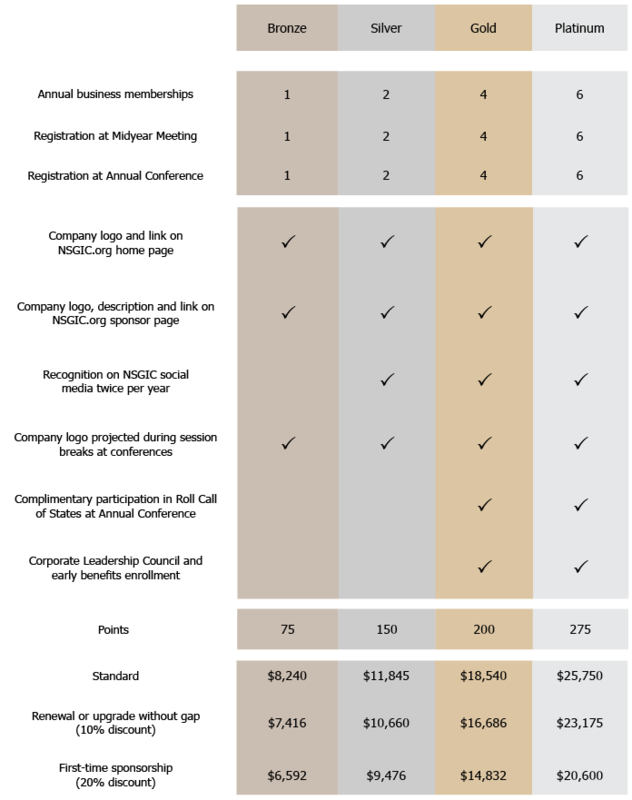 The program is designed for smaller companies, with 10 or fewer employees, so that they might participate fully in NSGIC conferences and grow towards becoming a NSGIC annual sponsor at the bronze, silver, gold, or platinum level. PLEASE NOTE: Point values listed per level may be spent towards a list of customizable opportunities. Sponsors may purchase additional points at the rate of $125 per point. Annual sponsorship is required for the Annual Conference and Midyear Meeting participation. Annual sponsorship is required for business membership. Annual sponsorship spans a period of one calendar year. Some benefits have limited availability and are confirmed on a first-come, first-serve basis. Platinum and Gold level sponsors have early access to benefit enrollment. All sponsor-developed content must be approved by NSGIC. In the unlikely event NSGIC and the sponsor cannot come to an agreement, points may be reallocated. Sponsorships may not be split between more than one company. Points may not be shared or reassigned to other sponsors. Sponsors may reassign sponsorship privileges within their companies. For example, an alternate representative may participate in the Midyear Meeting if the original representative is unable to attend. Conference-Only sponsorship level is limited to a one-time/one-conference use, after which a full, annual sponsorship level is required.